Daniel Heimuli (left) and Noa Naglu celebrate as once and future teammates. Photo by Glenn Reeves. 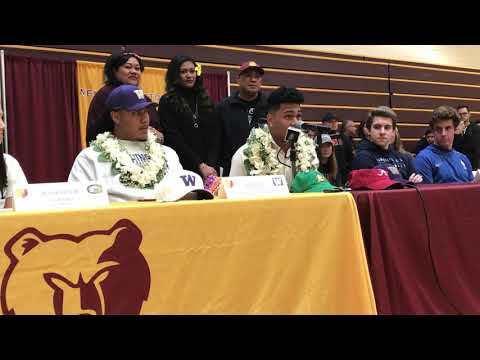 Heimuli made his much-anticipated announcement Wednesday at the M-A signing day ceremony in the school’s gym. He sat at a table with the school’s other college-bound senior athletes and thanked the teachers, teammates and family members who helped him along the way to his current position as a highly coveted linebacking prospect with a wealth of possible college destinations to choose from. Read the story here.